West St Leonards Primary Academy – a school centred around the ethos of excellent learning and friendship – is located in the St Leonards area of East Sussex, close to Hastings. 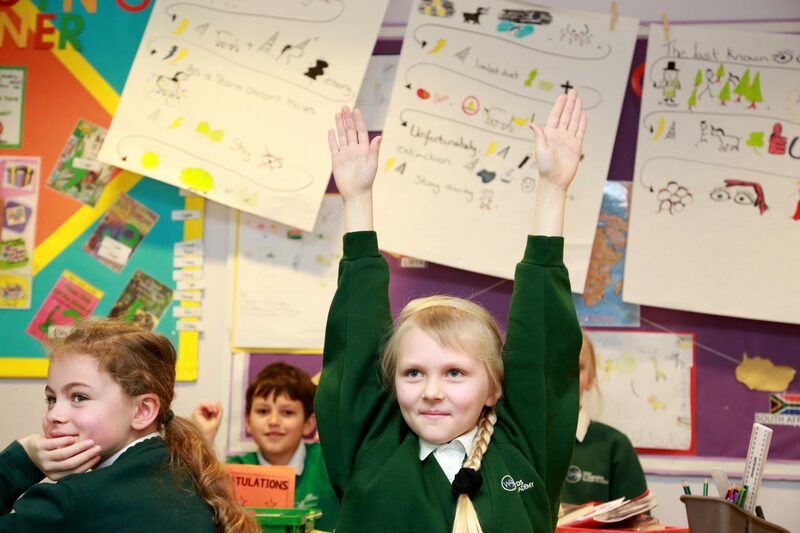 The school journey into Talk for Writing started in 2013, supported and inspired through the first ‘Big Day’ provided by Pie Corbett, where the staff’s enthusiasm for the strategies was visible even from the start. This has led to all staff having a profound involvement within the system, with frequent internal CPD sessions not only allowing staff to share good practice but also to allow a mentoring forum to support each other in areas that require further support. However, the enthusiasm of the staff does not stop there, as all staff have participated in a number of assembly based activities, including performing an imitated text in front of our 411 pupils, to show the dedication the staff have to the strategies whilst also showing how embedded the practice is within the academy. 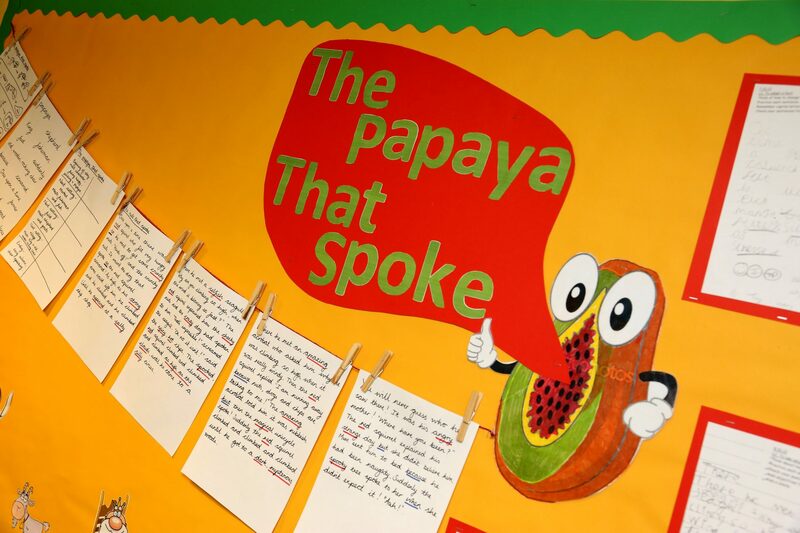 Through a topic based system, the school use an engaging ‘hook’ to draw the children into the learning. Whether it is finding your classroom has turned into a crime scene or whether a trip to the nearby woods shows bear prints in the mud, staff strive to engage the children from the very start and continue providing a similar level of involvement throughout the imitation phase and combining this with an unwavering stance on high expectations in the innovation and invention stages. We have found the cold task to be essential to the process as a means to identify where the common misconceptions areas lie within a text type in the various year groups. The adaptation of the model text based on these focus areas has meant that children have shown significant improvement as the text and subsequent lessons are directly targeted to the needs of the class but also to the needs of certain individuals too in the way that differentiation can occur across linguistic features that can be provided to extend or scaffold children’s learning. In terms of impact since Talk for Writing began at the academy, we have noticed a rapid rise in children meeting and exceeding the standard in 2014, sustained in 2015 for both key stages. Where the trend may have been disrupted with the introduction of the new curriculum, we have actually found the trend for children making progress actually increasing, thanks to the flexibility and ownership teachers have over the learning but also particularly due to the three part structure of the Talk for Writing process which provides the ‘imitation’ phase as a means for children to seamlessly meet the standards for spoken language as they regularly interpret texts in discussion; however –more importantly- children now have an excellent opportunity to present with expression and intonation, two areas that no longer need to be restricted to certain text types, role play activities or to targeted guided reading sessions; the complex, strategic planning within an already demanding curriculum has now been simplified through children’s imitation of a text, thus easing the teacher workload and allowing for staff to naturally incorporate curriculum standards within a well-established and supportive writing framework. West St Leonards Primary Academy offers ‘taster mornings’ which include opportunities to observe the Talk for Writing process in action across the academy, reflections with pupils’ books, planning a unit of writing, hear pupils’ views and hear about the impact on standards since we began in 2013. West St Leonards Primary Academy has been judged to be Outstanding in four areas following its inspection by Ofsted on 18-19 October 2016. The effectiveness of the academy’s leadership & management, the quality of its teaching, learning & assessment, its support for pupils’ personal development, behaviour and welfare, and the quality of its early years provision were all judged to be Outstanding; with pupil outcomes and overall effectiveness judged as Good. It is the only Good school nationally to have achieved four outstanding judgements under the current inspection framework, which has seen over 1,700 primary schools inspected. There will be an opportunity to tour the school, observe lessons, meet and look at pupils’ books, meet the Project Team and discuss the implementation and impact of this approach on teaching of writing.